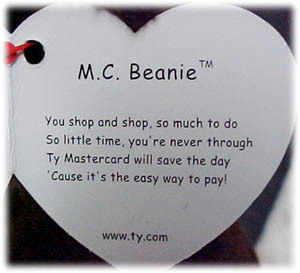 On August 14, 2001 Ty announced the MasterCard Beanie Baby. 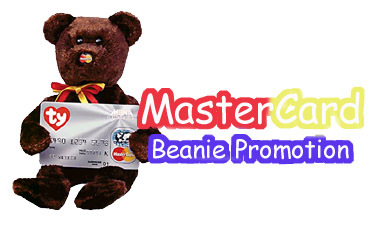 This beanie will be given away FREE to anyone who applies for a MasterCard from the Ty.com website and is approved and makes at least one purchase with the card. 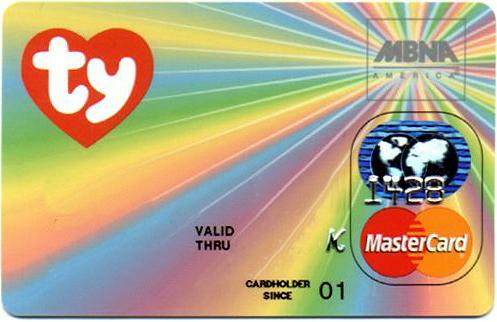 The MasterCard will sport the Ty Heart logo on the front and will be issued by MBNA. The image below is from the Ty.com opening page. Ty also claims that there will be more rewards given to card holders, such as every year you spend at least $5000 on your card you will receive a new exclusive Beanie Baby, also for every dollar you spend you earn points to buy Ty products. I ordered mine this morning, it was done through a secure transaction, they even offer to transfer balances for you, those transfers and the first 6 billing statements will carry a 3.9% Introduction Rate, with a 12.99% rate after that. There is no annual fee either. After placing the order it said to allow 30 days for the application to be processed. Over all it is not a bad card offer! I have seen worse cards in the airports with far worse interest rates! So little time, you're never through. 'Cause it's the easy way to pay! After several weeks of waiting people started receiving their cards! 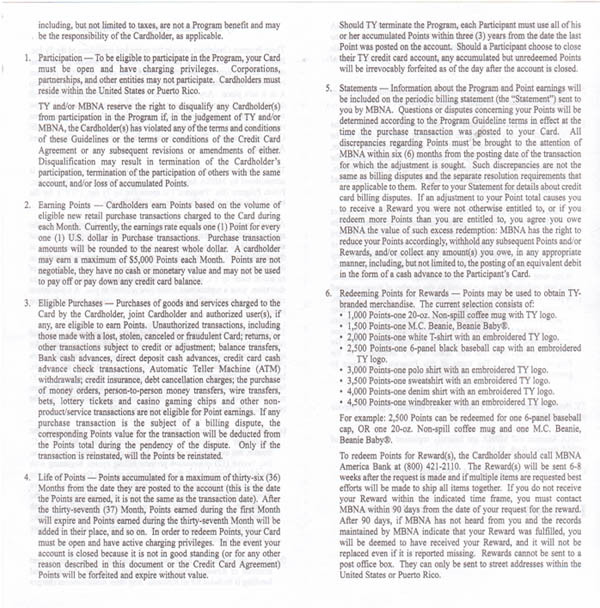 There are two possible cards, one is the Preferred Card, for people who received a credit limit less than $5000 and the Platinum Plus Card for those who received a credit limit $5000 or above. Once you build up enough points to buy something like the mug you will loose those points and have to start over to work on collecting the next item like another Beanie or t-shirt! Now these points are different from the over all $5000 you need to spend a year in order to receive another exclusive Beanie Baby! Ty Warner himself has also been signing some of these Master Card Bears hangtags! He is randomly selecting people to send these too! Wow what a special treat that would be! 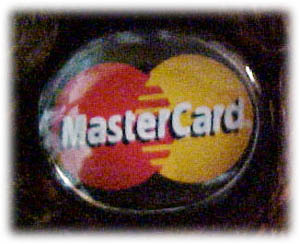 I am still waiting to get my MasterCard Bear! I made my first purchase one week ago! Someone on the TyTalk boards asks when they will received their second exclusive Beanie after spending $5000, well you will have to wait an entire year, well at least one year after you received your card! You can expect to have your first M.C. Beanie 10-12 weeks after making your first purchase with your Ty Platinum or Ty Preferred MasterCard. There is no registration process or anything else you need to do. You may redeem your points for an additional M.C. Beanie, or you may choose from any of the other Rewards offered. To obtain a points voucher to redeem your points, please call MBNA customer service at 1-800-421-2110 any time day or night. 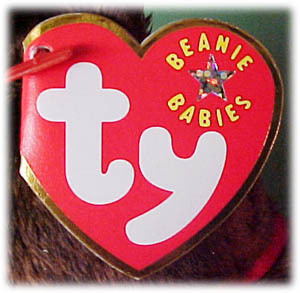 The Rewards Program offers a second exclusive Beanie Baby to everyone who accumulates $5,000 in retail purchases within 12 months of receiving their Ty MasterCard. 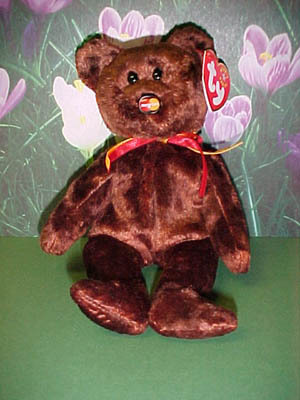 Your exclusive Beanie Baby will be shipped after the anniversary date of your account opening. 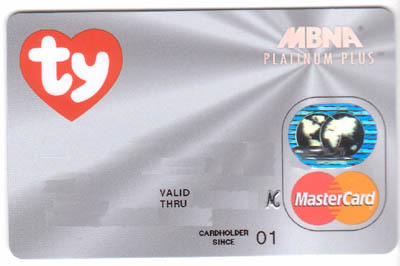 For example, if you opened your Ty MasterCard account on September 1, 2001 and used it for $5,000.00 in retail purchases by March 15, 2002, you could expect your exclusive Beanie Baby to ship sometime after September 1, 2002. I received my MasterCard Beanie in the mail today! Yeah! Here he is tags and all! I received the Bear with the black nose, there is also one with a brown nose! 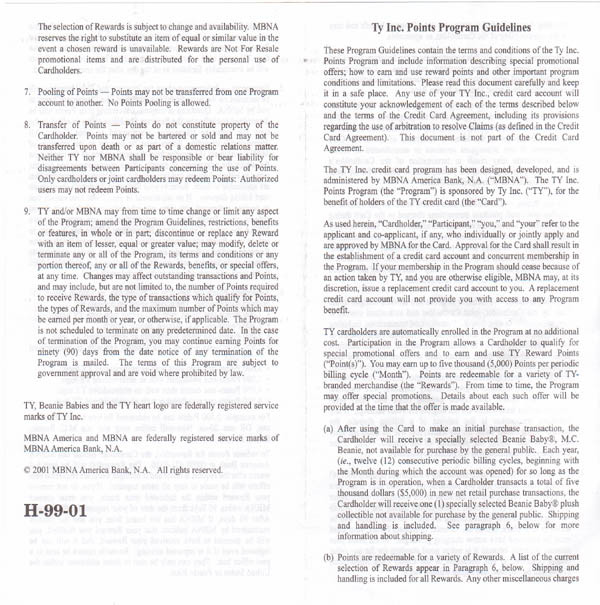 Click any image for a larger view!